As times change, so must leadership. With a new workforce that’s highly intelligent and largely possessing a different set of values and attitudes, we as leaders must learn to adapt to these changes to ensure we develop this generation into what’s best for our future. Following are some key leadership techniques to help achieve success in this ever-changing environment. Vision is a leader’s ability to see all sides of an issue and make decisions that are unbiased while maintaining a focus on what lies ahead. It is the foundation of my philosophy as a seasoned leader. Ensuring that your workforce shares your vision is key to your success as a leader. Visibility is a must for all leaders. Being visible to your team instills in them that you are genuinely concerned for their welfare. There is a saying that has always stuck close to me as a leader: “No one cares how much you know, until they know how much you care.” You bolster your credibility by making yourself present in the daily activities that your team is involved in. By being visible and getting your hands dirty, alongside them you have won a major battle in winning their respect and trust. Inspire your team to achieve all they can by talking to them about education, training, and leadership. Challenge them to excel in all aspects of their career because motivation and inspiration energize people. You can do this by satisfying basic human needs for achievement, a sense of belonging, recognition, self-esteem, a feeling of control over one’s life, and the ability to live up to one’s ideals. Everybody wants to be on a winning team. We all have a desire to be a part of something larger than ourselves. Standards are the building blocks of any organization, and as leaders, we are the guardians of those standards. Ensure everyone understands your position when it comes to the team’s values and standards and the importance of maintaining them. Live the values and your team will follow. Don’t destroy the spark of individuality that allows their creativity to flourish, with unnecessary rules, red tape, procedures, and restrictions. Make sure the standards and values are clear and are not restricted by rules and procedures. Invest in your people because they will always be your greatest asset. Integrity means doing the right thing. First, be true to yourself and this will come naturally. Be genuine with your team, and let them know that you expect the same from them. A leader’s integrity requires that he or she not be captured by peer pressures, protocol, mindless tradition, or conventional rules. This ability to disregard external pressures is what separates leaders from followers. Optimism is to emphasize the positives of a situation. Optimism and enthusiasm can be contagious if it is genuine. A positive attitude breeds positive emotions from others and will carry over even in the leader’s absence. One of my mentors would say, “Pride is Contagious,” and once you spread pride around an organization it becomes the heart and soul of anything you do. Never forget your roots. Always remember we all started somewhere. Every one of us began as a scared young man or woman who did not have a clue what they were doing. Utilizing patience, understanding, and forgiveness in certain situations may prove invaluable as an effective leader. Having patience can be difficult at times because you may be the most experienced person on your team. Leaders need to be able to discover their own strengths and the strengths of those who they work. By doing this, a leader will know how to leverage these strengths and have a better understanding of how everyone fits into a team. We must learn to make people believe they are important and that they can succeed. We all have an important part on this team in order to make it successful. People have always longed to think that what they are doing is something useful, something important, and something that will make a difference. Leadership is challenging and exciting. Leaders have the opportunity to mold and develop future leaders, but to be a good teacher, you have to first learn how to be a good student. Teachers need to develop good students which means we must encourage participation in the creation of goals and objectives, allowing their ideas to be modified and “owned” by everyone. Separating the individual –“I” – from leadership creates “we,” which builds a true sense of shared leadership and followership. We are the future we and need to accept the task of preparing this generation to meet the challenges ahead. We need to accept our role as leaders as an investment into our future, and not as a tax on the present. Be a servant leader and not a self-serving leader and you will be rewarded as you take the time to prepare future leaders. Remember, if a leader does not mentor anyone, they will leave no legacy. Philip F. Johndrow (pictured on the right) is a 33-year military veteran and a graduate of Trident’s Bachelor of Science in Business Administration and Master of Business Administration programs. 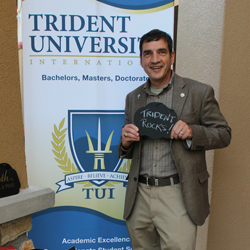 He currently serves as Trident’s National Director of Military & Veteran Alliances.